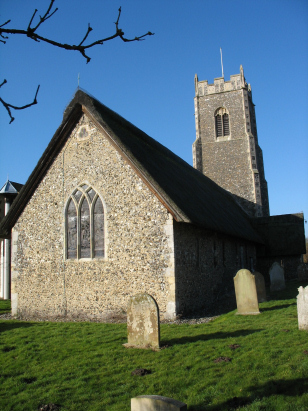 The parish of Eaton sits on the edge of the conurbation of Norwich, on the banks of the River Yare and south-west of the city by a mile or two. During the period of this transcript the parish changed rapidly from a semi-rural one dominated by farming to a suburb and home to many of the elite of the city, a haunt of Solicitors, Merchants and Gentlemen. Nowadays there is no clear break between Norwich and Eaton with the urban area flowing into one; though the area is still an attractive area for the comfortably off to live. 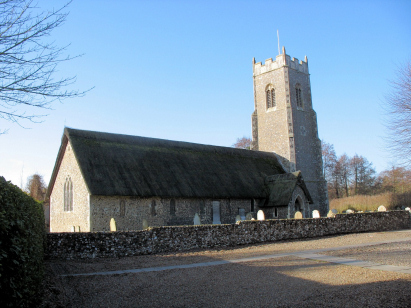 St Andrews church is a typical Norfolk Perpendicular church dating from the 13th to 14th century, although there was a major restoration in the 1860s at which time much was changed. The church is now an oasis set behind the commerce of supermarkets and suburban shopping areas. These records were transcribed from Microfiche 8 to 10 in the collection of the Norfolk Record Office. Although this is an old filming the images were good perhaps a reflection of the state of preservation of the originals. With the exception of the usual caveats regarding hand-writing this was a straightforward transcript to prepare and it is to be hoped few errors have crept into its compilation.